Brad and I had the good fortune to attend an open house event at US Highland's new facility outside of Tulsa, Oklahoma. The weather was near perfect and Highland treated the crowd to good eats from the Rib Crib and Backyard Burgers. But there was a lot more here than just a free lunch! The on-site test track was open for demo rides and examples of the company's high performance off-road motorcycles and four-wheeler were on hand. Highland AB is a Swedish company that has been building boutique bikes for over a decade. They also engineer nifty components for everyone from Husqvarna to Harley. Of course, we never hear about that stuff. A couple of years ago an American businessman took the bold step of suggesting motorcycle production be moved to the States. US Highland was born. I have to admit, we walked in the door having no idea just how impressive this operation would be. We weren't sure what to expect. Through the years there have been a slew of cottage industry bike builders, many armed with more money than business sense. It looks like Highland has the scratch and the savvy, and are serious about success. To get the details, we met the man responsible for transplanting a little taste of Sweden in Northeast Oklahoma, US Highland Chief Operating Officer and visionary, Chase Bales. Bales has raced all manner of motorbikes, and is a big guy. Fitting his large frame on mass-produced machines was partial inspiration for the custom-fitted motorcycles he now builds. He speaks with a booming voice and an assertive attitude that tells you he knows where he's going, and he plans to get there. It's no wonder the Swedes call him John Wayne. He showed us around the facility, an existing building which they transformed into a motorcycle factory in only 3 weeks. We ask about the rumors that Highland will be another repackage of Chinese hardware. He laughs and explains there is a Chinese manufacturing component to the Highland family. But for now their output is 150cc scooter engines solely for third world consumption. And that international reach is what sets Highland apart from the majority of specialty motorcycle makers that have come and gone. Highland designs and develops for some of the industry's biggest players. Motorcycle sales will not drive the company. In fact, they don't anticipate making a dime from motorcycle sales for at least five years. What Highland is building are custom bikes, running race-bred engines ranging from 350cc to 1050cc. The current lineup includes MX, Supercross, enduro and desert racing off-road bikes; a street legal flat tracker; the Viking sportbike and a four-wheeler. Each frame is made of stainless steel, suspension is Ohlins and it's all assembled at the factory in Tulsa. Each bike is built to specifications and measurements for each customer. Company plans include an online "builder" so anyone can configure the bike of their dreams. We continue our tour through the engine assembly room. Every motor is built by hand- fully blueprinted and tailored to the customer. 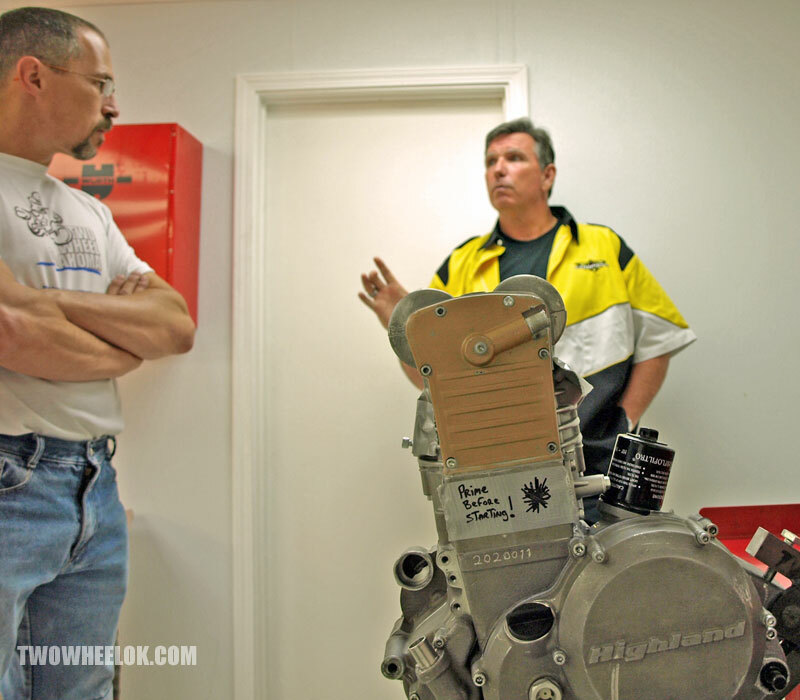 Bales points out a 950cc crankshaft assembly that's currently off balance by less than 1/10 of a gram. "It will be zero before it goes out the door," he explains. "We don't deal with tolerances, we deal with perfection." From some people that would sound like marketing speak. Coming from Chase it sounds like something John Wayne might have said. Excellent. Look forward to their success!